Everyone was taken by surprise when Angelina announced the divorce petition against Brad Pitt in 2016. 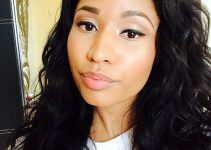 While the divorce and child custody battle is still underway, take a trip down memory lane and relive the perfect and sweet moments of the former couple. Check out the quaint celebration of their wedding as well as the iconic Angelina Jolie wedding dress. Brad and Angelina met in the set of Mr. and Mrs. Smith back in 2004 while Pitt was still married to Jennifer Aniston. They got engaged in 2012. Brad and Angelina adopted three children together and shares three biological children. They tied the knot in 2014 at their family chateau in France. The wedding ceremony was very simple, and only a few guests were invited. 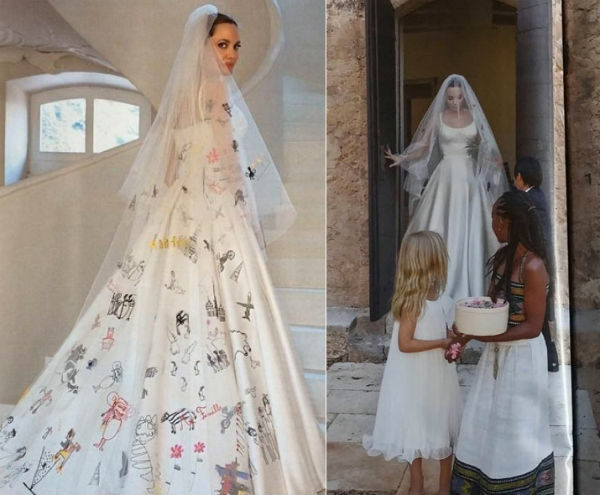 What everyone got talking about was Angelina’s wedding gown. 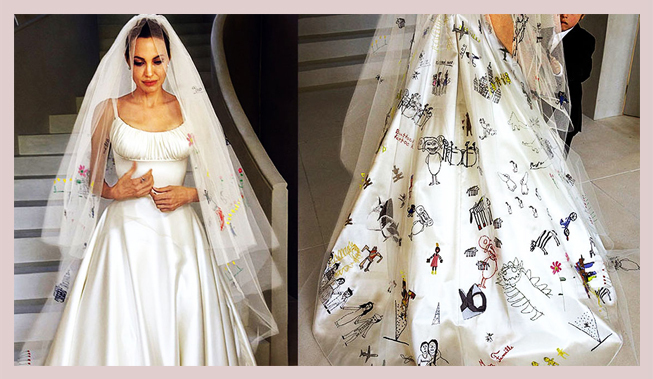 Luigi Massi created the iconic Angelina Jolie wedding dress. The dress featured a ruched bust, thin straps fitted bodice, and a long flowing skirt. Angelina selected Luigi to create her gown because he is practically her family. The drawings found on her skirt and veil were all hand-sewn by Luigi himself. 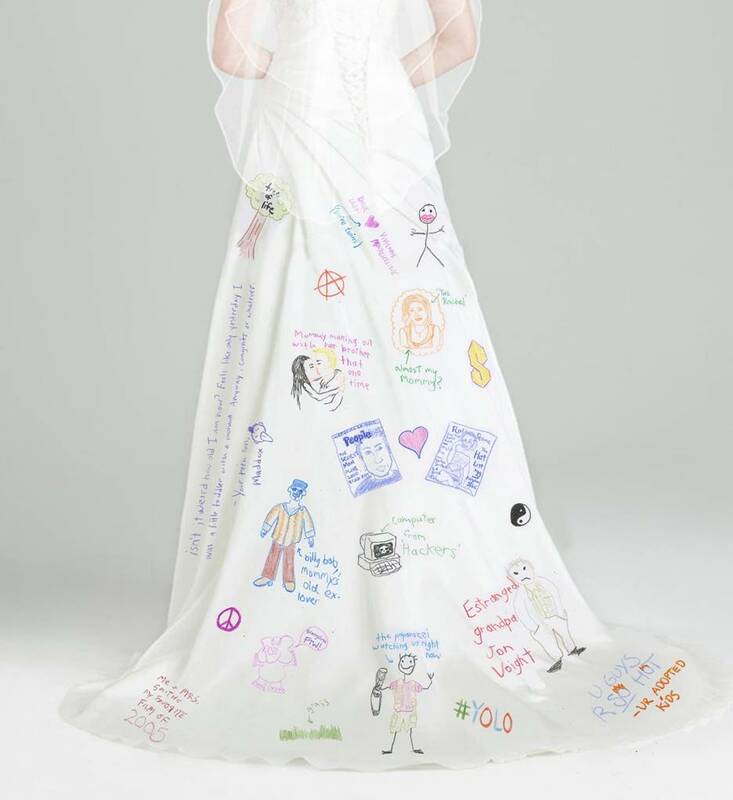 The drawings on her dress were drawn by all her children, namely Maddox, Zahara, Shiloh, Pax, Knox and Vivienne. The Brangelina kids were very much involved with the wedding. Aside from contributing to the overall design of Angelina’s gown, they also baked the wedding cake. 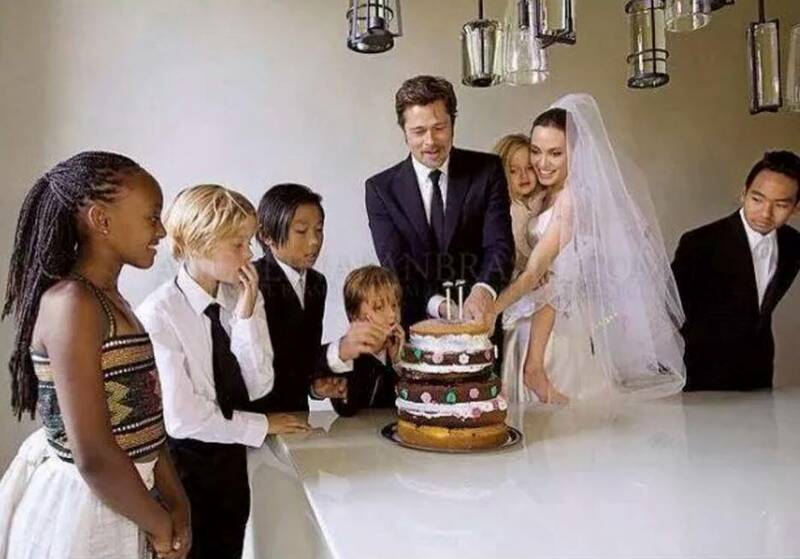 The Brangelina wedding in 2014 was a very happy occasion for their entire family. The full details of their nuptial was featured by Hello! magazine. Fans had mixed reactions with Ange’s gown. Many aren’t happy with how the design turned out, while others thought that it was a great and heart-warming idea. Quite frankly, there are still a lot of fans hoping that Brad and Ange would eventually get back together, for the sake of their relationship and the kids.